Overwhelmed? Disorganized? Living in CHAOS? 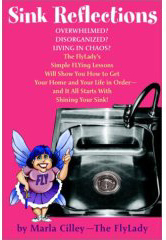 The FlyLady’s Simple FLYing Lessons Will Show You How to Get Your Home and Your Life in Order—and It All Starts With Shining Your Sink! Bantam Books, New York, 2002. 223 pages. Then I had surgery last February, and my house got hopelessly messy, and I felt hopelessly behind. I needed to work on getting ready to move, too. My husband was actually filing for divorce, and my spirits weren't good. So I decided to give FlyLady a try. What’s more, her way of thinking is transforming my life. One of the biggest areas of conflict in my marriage—and a major way I brought resentment into our relationship was my constant fussing about housework. I never seemed to be happy. I always seemed to think my husband or sons should be doing more, but then if they did something, I’d often criticize how it was done. I’d nag them and hound them. Was grumbling about housework or making the burden "fair" worth my marriage? Absolutely NOT! You may have picked up this book in your never-ending struggle to find the magic formula to fix your family and your home. But, sweetie, the problem with your home has nothing to do with idleness on your part. I hear what you hear over and over again—the reason your home is trashed is because of your laziness. Wrong! I know for a fact that I have never been lazy and I will wager the same about you. Your problem is that you don’t know what to do first and when you decide on a course of action, you are continually spinning your wheels and unable to finish anything. By the end of the day you are exhausted, the house is still trashed, and you have accomplished nothing. I just wish I could give you a great big hug.